The Xiaomi Mi Mix was Xiaomi's first attempt at a bezeless smartphone. The company also followed it up with a successor which is known as the Mi Mix 2. 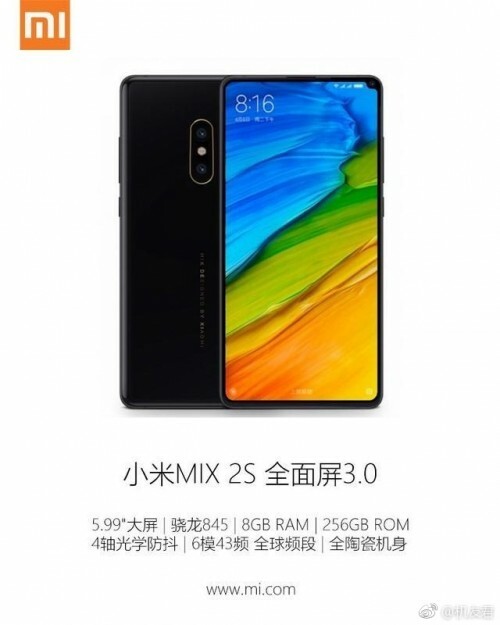 Now, base on reports and official teasers from Xiaomi, the company is currently working on a revised version of last year's Mi Mix 2 and it will be called the Mi Mix 2s. Base on leaked information at hand, the device is expected to feature a full ceramic unibody with 5.99-inch full screen display as well as a Qualcomm Snapdragon 845 chipset under the hood with an octa-core CPU clocked at 2.8GHz. It will also come with an 8GB of LPDDR4X RAM along with 256GB of high speed UFS storage. The Mi Mix 2s is expected to spot a dual rear camera setup with both having 12mp based on the Sony IMX363 sensor as well as optical zoom feature. The device will also have a front mounted "under display" fingerprint scanner and support for Global 4G LTE bands just like it's predecessor. Information about the launch date and starting price is not available yet, so I guess we all have to wait untill Xiaomi makes an official announcement.